A hose assembly’s maximum working pressure cannot be higher than its lowest rated component. 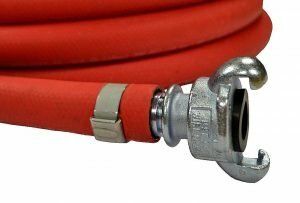 In the above air hose example, Chicago universal couplings (see photo of red air hose) are factory rated at 150 PSI when properly installed. This rating also assumes they are used at ambient temperature without any added stress. The hose clamp is another key factor in establishing a working pressure rating. Ensuring that the clamp does not decrease your assembly working pressure rating is two-fold. First, it must be compatible with the hose type, the coupling, and application, and carry an equal or greater maximum pressure capability. Second, it must be installed per manufacturer procedure and torque or tightness recommendation. Make sure the clamp is installed tightly, but not gouging deep into the hose, and ensure that the coupling is inserted fully and the clamp is seated properly. Additional factors can decrease working pressure rating including temperature (inside the hose and out) and stresses such as end pull or pulsation. 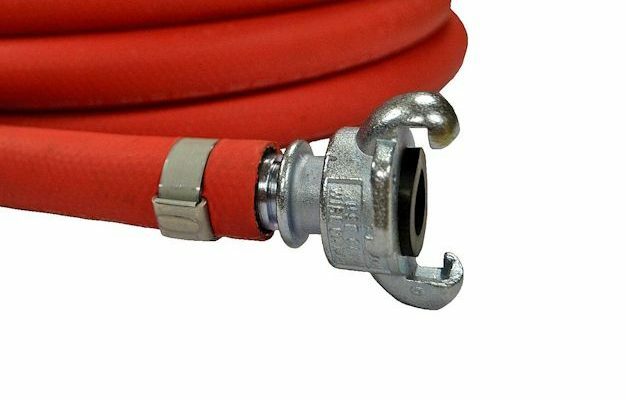 A hose hung from its coupling without any bracing or support and under pressure can cause a failure even when operating within the hose assembly’s capable pressure range. Elevated temperature can reduce an industrial hose working pressure by more than half. Refer to the chart and additional info here. All of these factors can reduce the rating marked on the hose significantly. Determine your safe operating pressure limit, inform all potential users of the hose assembly, and tag the assembly with its proper rating. Also keep in mind that a used hose may not perform as well as a new hose, even if it appears to be in serviceable condition. If an application will be near the peak of an assembly working pressure, consider installing a new hose for best performance. 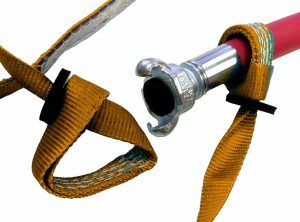 Install hose safety cables or whip checks to reduce the risk of injury if an accident were to occur. Inspect hoses regularly as well, and remove them from service BEFORE they fail.